Wakame is a type of seaweed that's very popular in Japanese cuisine. It's most often used in miso soup and chilled salads. Here, the wakame is sliced and mixed with cucumber and sesame to make a light and refreshing side dish. Choose a green variety of wakame for a milder flavor. If using dried wakame, rinse and soak first in clean cold water for about 10 minutes -- longer if you want to reduce the saltiness. Then remove and slice into very thin strips. Slice cucumbers into round discs and put in bowl. 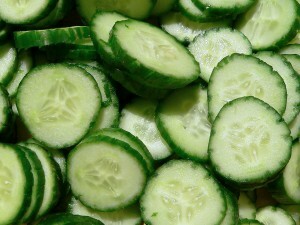 Add a generous sprinkle of salt to the cucumbers and allow to sit for 15 minutes. Drain cucumbers in a colander or sieve. In salad bowl, whisk together the rice vinegar and sugar, then taste and add salt, sesame oil, and sesame seeds. Add the cucumbers and wakame to the dressing and toss together to blend. Serve immediately.